This past summer, I made a decision to create a fresh start for myself. I’ve been a believer since I was in first grade but hadn’t committed to a church body in years. I had been to Milestone intermittently but realized that just going every once in a while was not enough. I needed more. I decided to go to the teacher celebration service in August 2018. As a teacher myself, I really needed to be encouraged and to receive prayer at that service in particular. I’d had a really hard first year of teaching; I was devastated by how horrible it turned out to be and nervous about starting another school year. I had just signed on to work in a new grade level, in a new school, and in a new school district. Everything about my teaching career was changing which was unsettling and scary. After that service, I decided that Milestone was where I needed to be in order to grow into the teacher and woman that I have been called to be. I went all in. I went to Discovery 101 and joined a Closer Small Group immediately. Unbeknownst to me, the Small Group that I joined was full of teachers. Instantly I felt at home. We had so many things in common. We had similar beliefs, were able to go back and forth with stories about our school kids, and we all wanted friendships beyond the school walls. These women became some of my best friends. I truly believe God put my small group girls in my life at the right time for a reason. Everything was going well in my life. I had just started teaching at a new school and was really enjoying it. I had a great boyfriend that I thought I was going to marry, and my life was just generally going well. But then, early this year, my boyfriend and I broke up and my life turned upside down. 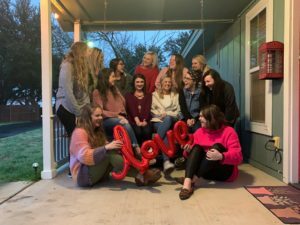 At first, I was just going to the group looking for friendships, but now, these girls were getting me through my hardest moments. They checked on me every day, laid hands on me in prayer, and were there any time I needed them. My small group girls quickly went from being my friends to being my spiritual family. They encouraged me to go to talk to one of the pastors. I realized during that conversation that I needed to be baptized. I grew up in a different religious environment and was baptized as an infant. My heart had been very hard when it came to getting baptized here at Milestone due to preconceived notions and fear of what people would think. After a lot of praying and some amazingly wise counsel, I made the decision to be baptized. I was baptized this past Saturday night during Baptism Weekend! I am so incredibly glad that I was able to proclaim the lifelong commitment I made to God in front of my natural and spiritual families! We are so excited for you, Sierra, and for everyone who made the decision to be baptized during our Baptism Weekend! Love this! That’s awesome that Teacher Appreciation Weekend was the catalyst for you to get plugged in and so glad you did! Thanks for sharing Sierra! So many folks need to hear your heart felt message of the impact that spiritual family has made and making on your life. So proud of you and your quality decisions. Sierra – I am so very proud of you! I love seeing you shine. Well done sweet sister! Wow, Sierra! That picture says everything and that we are truly better together! So thankful you’re a part of our church family, Sierra!